As winter starts to rear its ugly head most of this great country (USA...USA), the concept of a convertible might be the last thing on your mind, but it is actually the best time to buy a convertible if you want the best price. Find something interesting/fun with a removable top for less than $5k. 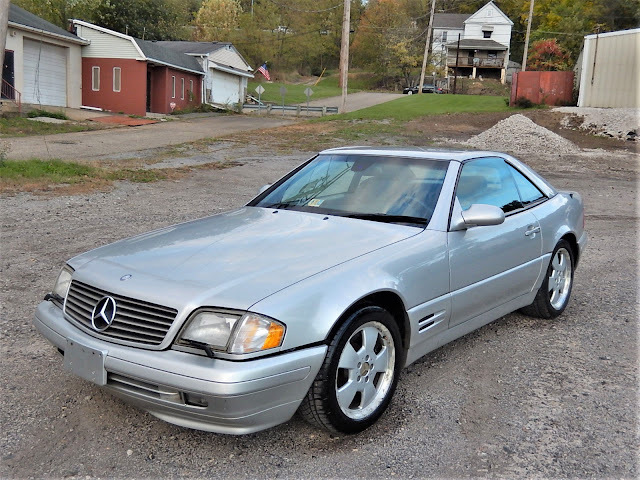 My choice is this 1999 Mercedes-Benz SL500 here on eBay bidding for $2,125 with 2 hours to go located in Struthers, OH. Find the best convertible for sale on the interweb. I'm ripe for a mid-life crisis car. This actually seems like a cheap short term fix for that? V8 Jag? Why the heck not? Does that Jag come with a bunch of polaroids and a note to not forget to get a tattoo to remind you where you parked? The SL500 went for $3401, which seems like a rockin deal to me. Anybody had experience with the XK8s and maintenance. Seems cheap to get into, but are they ultimately bad money pits? '86 Le Baron with less than 50K on the clock.